We have developed the following resources for individuals and organisations. 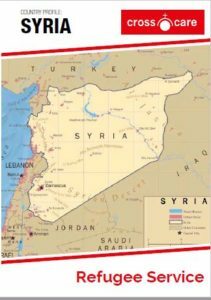 To support the integration of Syrians arriving under the Irish Refugee Protection Programme (IRPP), Crosscare Refugee Service has produced a Syrian Country Profile. It contains information on Syria, its people and the Syrian way of life. This leaflet was designed for staff and volunteers working with Syrians. It aims to promote cultural awareness, enable communication and lead to better outcomes for these clients. Crosscare Refugee Service has developed an information leaflet for people with refugee status or subsidiary protection who have family members joining them in Ireland under the family reunification programme. This leaflet is available in English, Arabic and Somali. This is a quick reference guide on ‘what to do’ and ‘where to go’ for people at risk of or experiencing homelessness. It is aimed at professionals coming into contact with households at risk of or becoming homeless, as well as those households themselves. The guide provides information on and contact details of direct access supports and services in the Dublin area in one easy-to-use resource. It is designed to support appropriate and quick engagement with services that could help a person avoid homelessness or allow for easier navigation of services & supports in the early stages of homelessness. Download here: Guide to Homeless or at Risk of Homelessness Services and Supports 2018. In partnership with Dublin North City GP Training and Cairde, and funded by the Irish Human Rights and Equality Commission, we have developed a number of resources around migrants access to health. Migrant Health Care Module Handbook – training module for trainee GPs on the right to health for vulnerable migrants in Ireland – will be uploaded shortly. How to access primary healthcare services and supports in Ireland – infographic poster for display in GP clinics, health care centres & migrant support services. Information leaflet for migrants accessing healthcare including what ‘Ordinarily Resident’ means and access to free or subsidised healthcare supports and services. 1 Cathedral Street, Dublin 1, D01 EF86, Ireland.